The entrance to the MSF Hospital for Reconstructive Surgery in North East Amman, Jordan. The hospital is unique in offering a free care package for victims of war from across the Middle East. 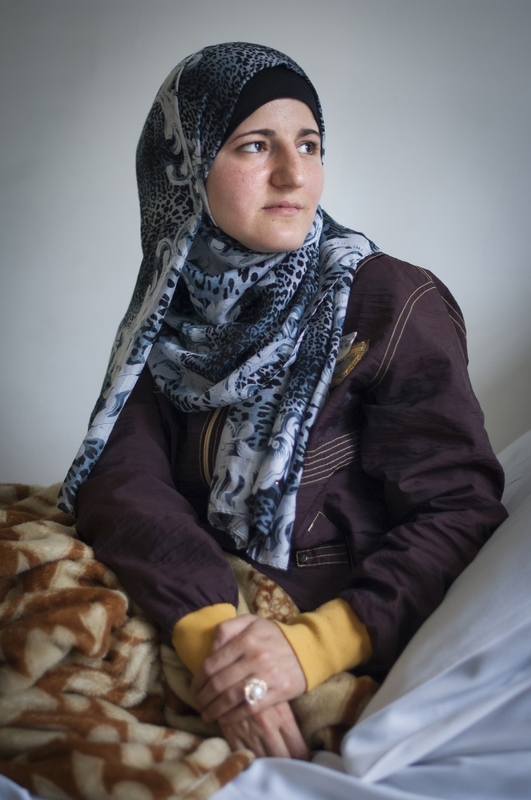 35 year old Syrian refugee Saha from Aleppo. 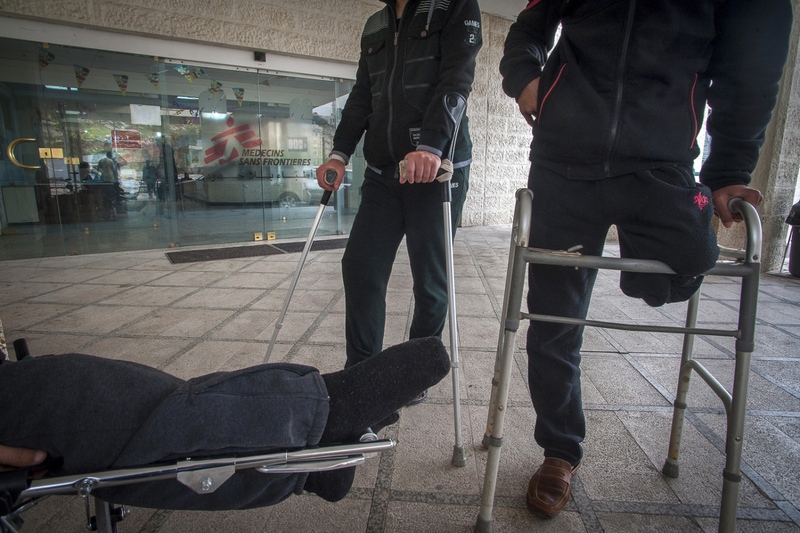 Saha was injured in the leg and hand from a blast from an artillery shell while sheltering in a suburb of Aleppo in 2012. Luckily she survived as the woman sheltering next to her was killed by the same explosion. Saha has had 19 operations so far to save and then correct her injury to her leg and hand. She has been plagued by some infections and inadequate surgical procedures with some of the previous hospitals she has attended. Now with MSF her treatment will be free. 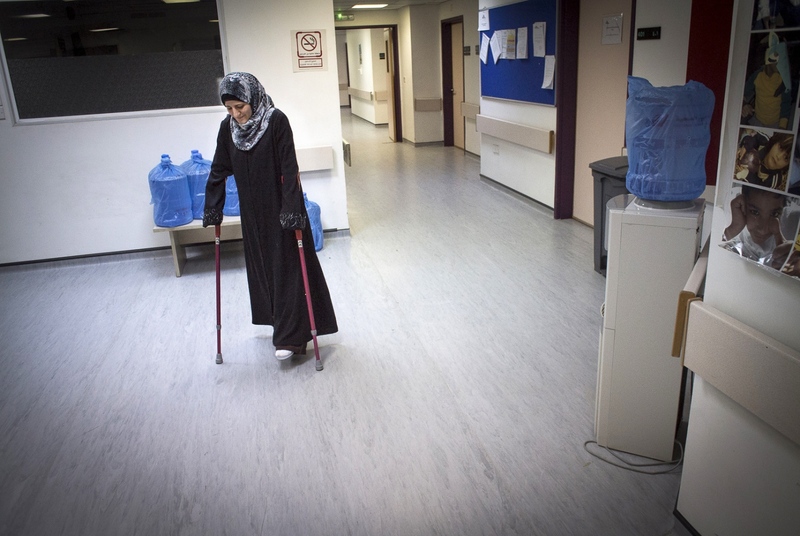 A burns patient in recovery in the Operating Theatre of the MSF Hospital for Reconstrucive Surgery in Amman, Jordan. 43 year old Orthopedic Surgeon Dr Ali AlAni in surgery at MSF's Hospital for Reconstructive Surgery in Amman, Jordan. Dr Ali is operating on a patients sciatic nerve which has been damaged from shrapnel wounds to both legs from a roadside bomb in Baghdad, Iraq in 2014. The operation is intended to bring functionaliy back to the patients legs and allow walking again. 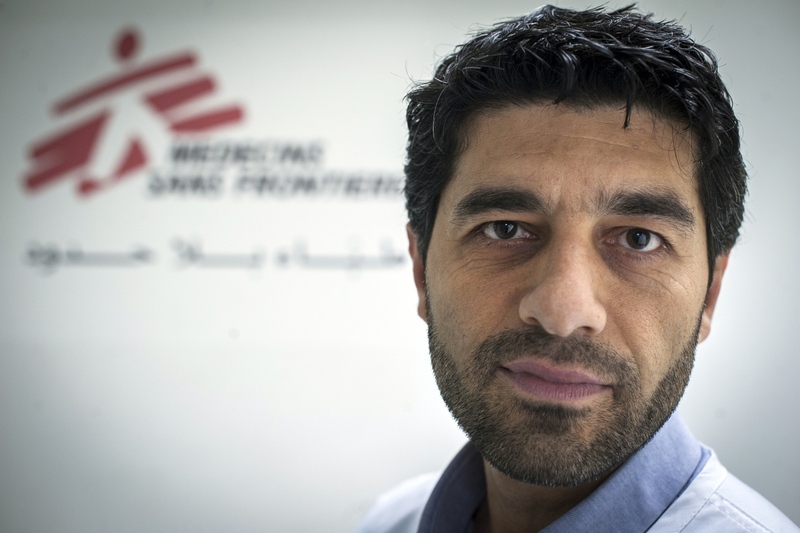 Jean-Paul Tohme is the Project Coordinator for MSF Hospital for Reconstructive Surgery in Amman, Jordan. Dr Ali AlAni examines a patient on his ward rounds post surgery. 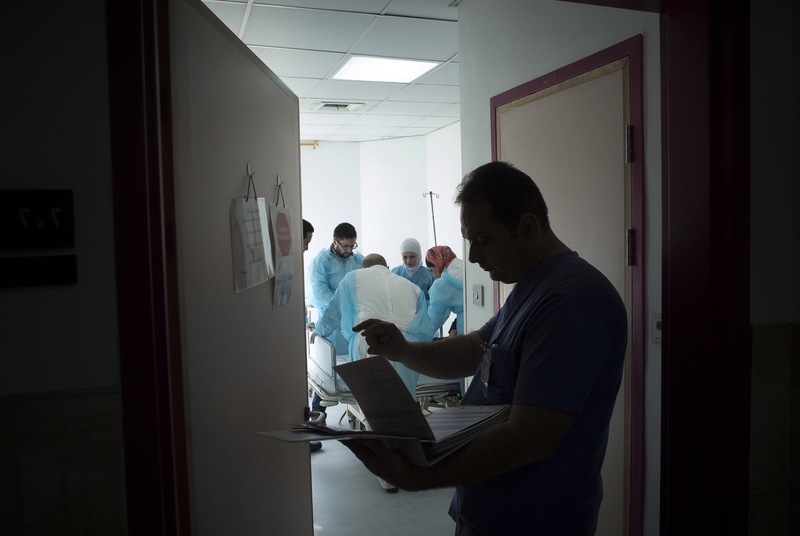 He's accompanied by his surgical team at the MSF Hospital for Reconstructive Surgery in Amman, Jordan. Dr Ali AlAni examines a patient confined to an isolation ward due to infection. 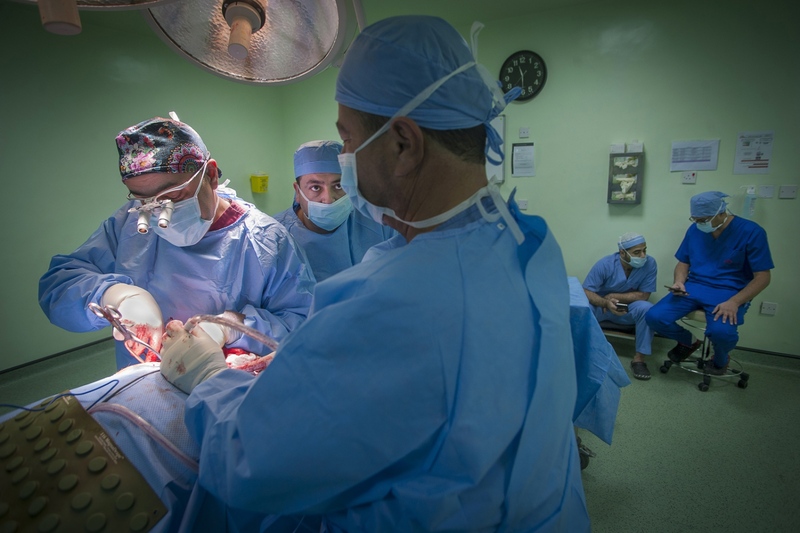 He's accompanied by his surgical team at the MSF Hospital for Reconstructive Surgery in Amman, Jordan. 43 year old Iraq born Orthopedic Surgeon Dr Ali AlAni examines a patient to access the ongoing treatment that might be required, He's accompanied by Jordanian GP Zaid Sabeeleish, Physiotherapist Saleem Omar and fellow Orthopedic Surgeon Hanna Janho all from Amman in Jordan. Sat peacefully on a hillside in the North East district of Marka within the Hashermite Kingdom of Jordan’s capital Amman is the Medecine Sans Frontieres/Doctors Without Borders Specialized Hospital for Reconstructive Surgery. 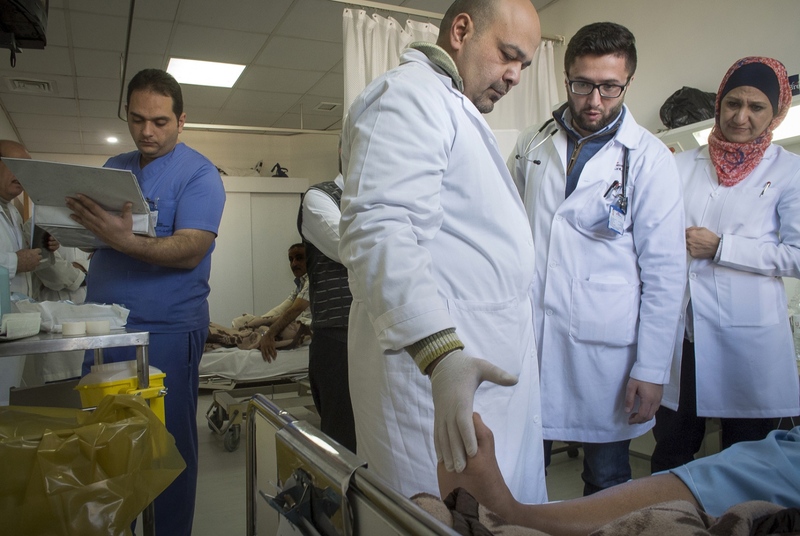 First established as a surgical project within a wing of Jordan’s Red Crescent to care for victims of war from Iraq in 2006 it has broadened its mandate to receive patients from Gaza, Yemen and most notably Syria. 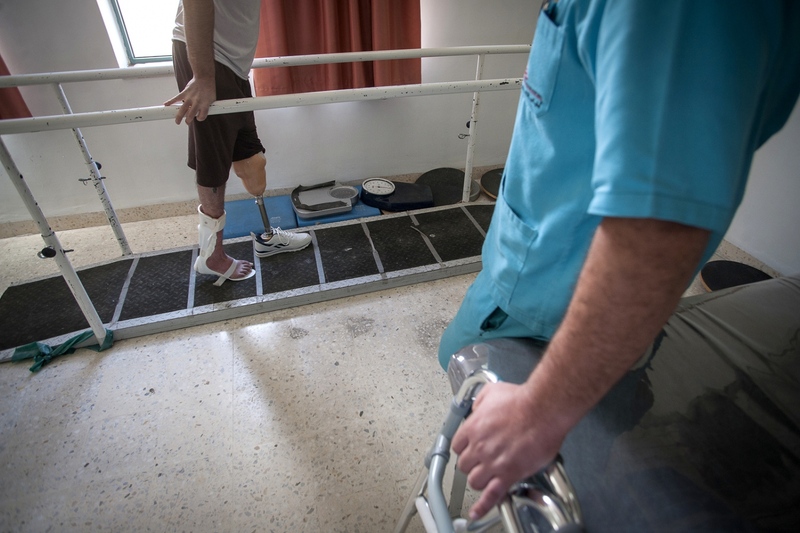 Additionally since the 8th September 2015 it established itself, at new premises, as a fully-fledged medical facility devoted solely to reconstructive surgery, physiotherapy and psychological support for victims of war. 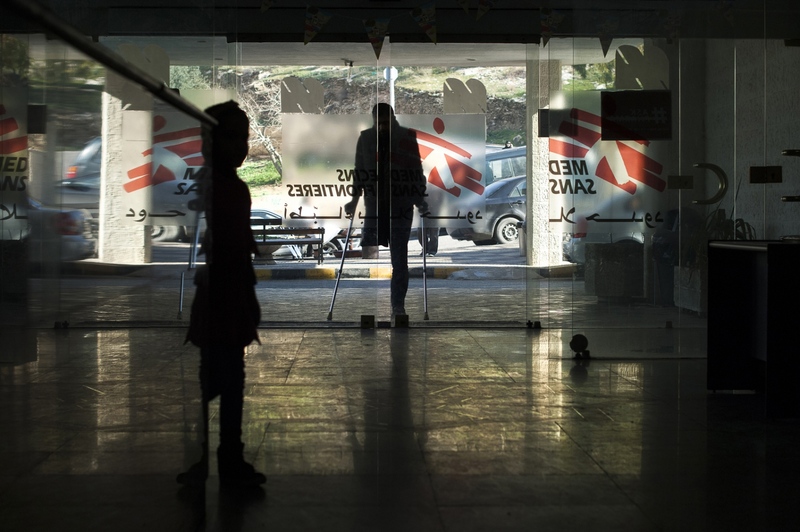 The MSF Hospital of Al Mowasah on Tirmizi Street in Amman is unique in offering a comprehensive care package for its patients free at the point of delivery. It is the societies biggest single annual financial commitment with an expense of some €10 million per year and a departure for the organization from a solely disaster response role to one that incorporates and offers ‘a life rebuilt’. Testament to this is Saha a dignified and unassuming 35-year-old single Syrian woman originating from the Saladine district of the war ravaged city of Aleppo. While resting in one of the full time accommodation rooms MSF offers to its patients during their stay at the Hospital Saha starts to recount her story starting in 2012. Her mother Amira sits patiently on an adjacent bed listening to her daughter: “Before the war I was living a very simple life. I worked in a shopping mall and I come from a middle class and comfortable family in Syria. It was between 7 and 8 o’clock in the evening during Ramadan (this is in the ninth month of the Islamic calendar and is observed by Muslims as a month of fasting from daybreak to sunset) and I was walking to my sisters in the Kallaseh district of Aleppo when shells started to fall around me. I sort refuge in a house along with several other women and children. With in 2-3 minutes of being inside one of the shells hit the house and the woman next to me who was standing was killed instantly and I received shrapnel wounds to my hand and legs and broke 3 of my ribs. I remember a flash of light and an explosion and I could see my arm flapping about in front of me when I tried to move it. I was screaming-my legs my arm- but I never passed out and I was eventually wrapped up in a blanket by other survivors and carried to the nearest clinic at the ‘Abdel Aziz Hospital’ and then moved later to the ‘Al-Razi Hospital’ where surgeons tried to save my leg.” It’s been a long journey for Saha. She’s endured 19 operations so far to try and correct the damage done to her. She’s suffered complications with infections to her wounds. The incorrect setting of her arm in Aleppo damaged the nerve endings in her fingers inhibiting recovery and the additional tragedy of the death of her father in Syria, also as a consequence of shell fire, shortly after her own injury. On finishing his rounds at 10.30am he descends the stairs from the operating theatre’s recovery rooms and makes his way to the ground level where his day will continue processing some of the first appointments to the hospital and assessing these patients’ needs. Walking along the corridors he’s greeted by some of his former patients and they’re eager to show their gratitude and admiration by shaking his hand as he passes. Indeed later in the day in a consultation room Dr Ali is given a joyful kiss by a thankful patient on the news that his wound is now in full remission: “These things, these successes sustain you through the times of exhaustion.” Dr Ali comments after the man has left the consulting room. 3 other team members always accompany him in these sessions of patient review. A fellow Orthopedic Surgeon to concur on surgical treatment a General Practitioner and a Physiotherapist in order to undertake a full and comprehensive assessment of medical need. 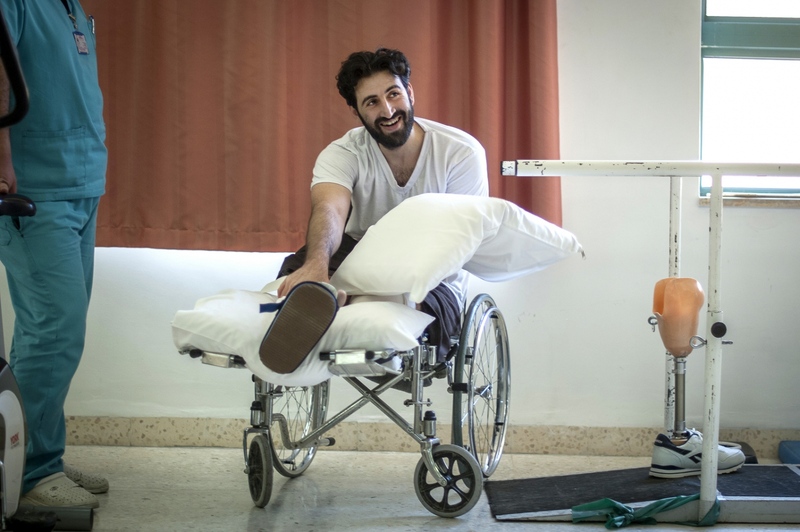 Across on the other side of the Hospital in the Physiotherapy Department Moayed Srour a 29-year-old Law Student from Al-Shaykh Maskin City in the Darah region of Syria is learning to walk again with the aid of an artificial leg. Zuher Hizzy, one of the hospitals physiotherapists is putting Moayed through his paces with his prostheses: “He’s a slave driver.” Moayed says with a smile, in reference to his physiotherapists, as he’s encouraged to put more of his own body weight on to his artificial leg while supporting himself on the parallel bars. “I’m preparing myself for another year of this but Zuher believes it will take another four.” Moayad was hit by a tank shell while sheltering behind a wall with some of his friends in December of 2014. Loosing consciousness with the injury he woke up 7 days later in Amman with is right leg below the knee amputated. 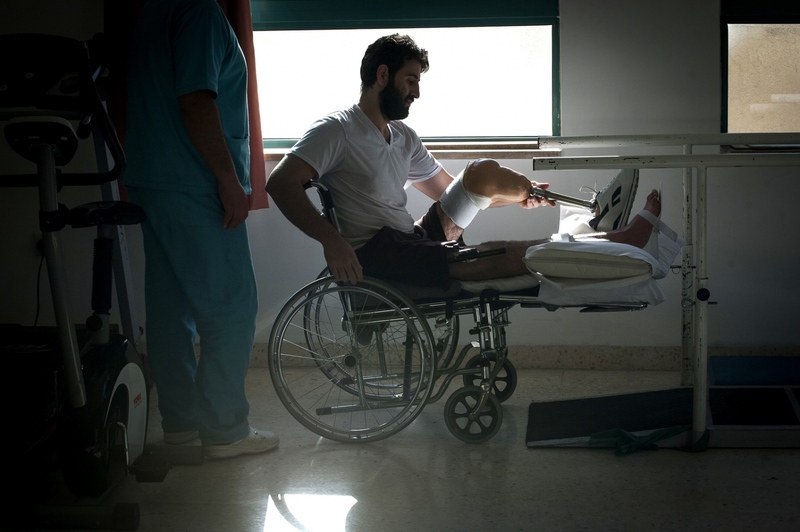 He then spent 4 months in the Zaatari refugee camp on Jordan’s northern border awaiting his turn to come to the MSF Hospital: “I can’t remember how many operations I’ve had so far. Maybe 14 or 15 but it would of taken me forever to recover without this place.” He adds before returning to the disciplined task of his own recovery.